Hello everyone! I'm actually participating in two birds Inspiration Monday for the first time in weeks! Can you believe it?? Anyway, the model this week is Alyssa Miller - Jake Gyllenhaal's girlfriend. My pictures aren't the best, my regular camera died so I had to rely on the cell phone this morning - but I kind of went for a mishmash on both of their outfits in a way! And it's St. Patrick's Day so I had to pull in some green too! 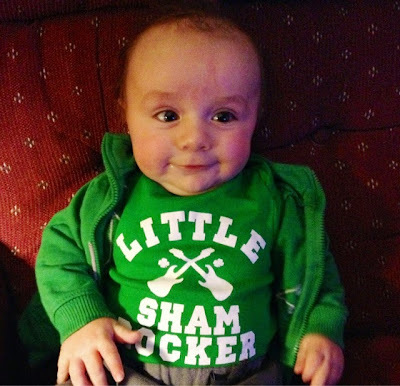 I am a small amount Irish - and I know, aren't we all on St. Patrick's Day? - and it may not be much, but I'm proud of what I have! We'll be celebrating this evening with corned beef brisket and a little beer. Last year Mr. Monkey and I may have went a little overboard in our celebrating, so I'm kind of glad we will be keeping it a bit more low key this year! And before I go, I have to share this picture of my little lucky charm - he just barely fits into this onesie I bought him for today from Old Navy, but it at least works well enough for today! He's my favorite. He was so well behaved at my cousin's wedding this weekend - I was pretty proud of him! He did great in the car too which gives us encouragement for a bigger road trip we'll be taking this summer! Happy St. Patrick's Day to you all! And be sure to check out two birds here for more Inspiration Monday outfits! i love that you mixed both outfits! and i love your dress. and what a sweet pic of ollie!! i'm so glad he did well this weekend! Happy St. Patrick's Day dear! What a cute look! I love your jacket! Have a fabulous St. Patrick's Day! Yay! 3 Cheers for Oliver - yay, yay, yay! Thanks for your fun compliment. I'll have my biopsy info on my 'pink update' when I know the results. At this point tho, I am thinking 75% for lumpectomy. Yay - again. oops, duh! I love your ensemble today. Looks great on you. Awww what a cutie!! And I love that you combined the two looks for your IM outfit--it turned out so cute! It looks really cute! And awwwwww! What a cutie pie! Glad the road trip worked out! He looks adorable in bright green. What a little ham. I am glad it was a smooth wedding for him, too.